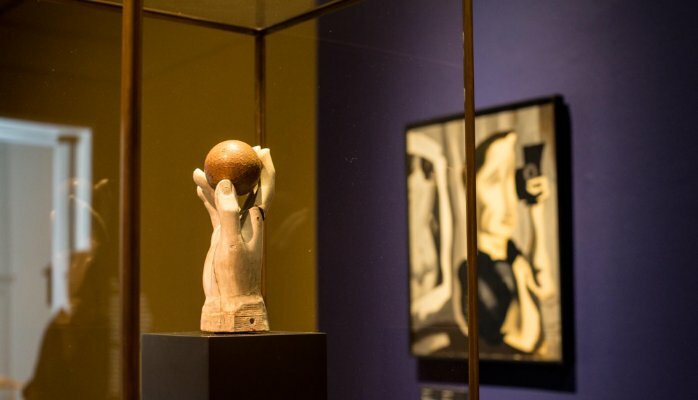 Installation view of the exhibition Man Ray—Human Equations: A Journey from Mathematics to Shakespeare, at the Ny Carlsberg Glypotek, in Copenhagen. Several exhibitions, such as Warhol Underground, at the Centre Pompidou-Metz, and Man Ray—Human Equations: A Journey from Mathematics to Shakespeare, at the Ny Carlsberg Glypotek, in Copenhagen, and the Israel Museum, in Jerusalem. The three-day “Wordstruck” symposium, for instance, explored from a literary perspective how artists’ thoughts shape the development of American culture and society. Through six keynote lectures and 26 shorter presentations, scholars challenged the stereotype that artists do not create new ideas but merely interpret, in visual form, those of others. Another example is the Terra Summer Residency, which since 2001 has brought together doctoral scholars of American Art and emerging artists from institutions worldwide for a nine-week fellowship program in the historic village of Giverny, France. The residency provides an opportunity for participants to widen their academic and creative horizons, explore varying cultural perspectives, and forge lifelong exchanges and professional networks. Established in 1978, the Terra Foundation for American Art is dedicated to fostering the exploration, understanding, and enjoyment of the visual arts of the United States. With financial resources of more than $350 million, an exceptional collection of American art from the colonial era to 1945, and an expansive grant program, it is one of the leading foundations focused on American art, supporting academic programs, exhibitions, publications, and research worldwide.